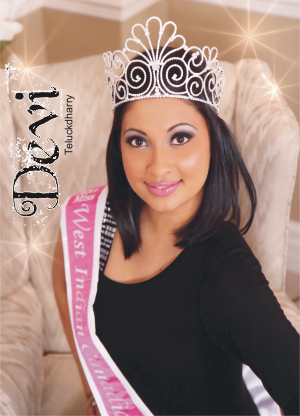 The Miss West Indian Canadian 2011, Devi Teluckdharry, accomplished, “One for the family”, when she took home the second annual crown on October 31, 2011 at Pearson Convention Center. Born into a family with two older pageant winning sisters, it’s no surprise that this confident 23 year old captured the judge’s top scores. “I don’t usually have insecurities. My sister’s are always there to encourage me. They taught me to love myself. I am, who I am”, says Devi. Devi moved from Guyana 10 years ago, finished her high school studies in Canada, and pursued a number of certificates to reach her current position as a financial service manager at a financial institution. She has spent 5 years in this position, changing the lives of her clients, and aspires to operate her own branch. Undoubtedly, Devi’s passion for helping others was evident as she listed the many charities and events she has supported; the Salvation Army, run for the cure, and Scott mission, to name a few. “Giving back to and developing our community“ is Devi’s overall objective, which became more prominent throughout her interview. Can you tell me about some of your ambitions in life?